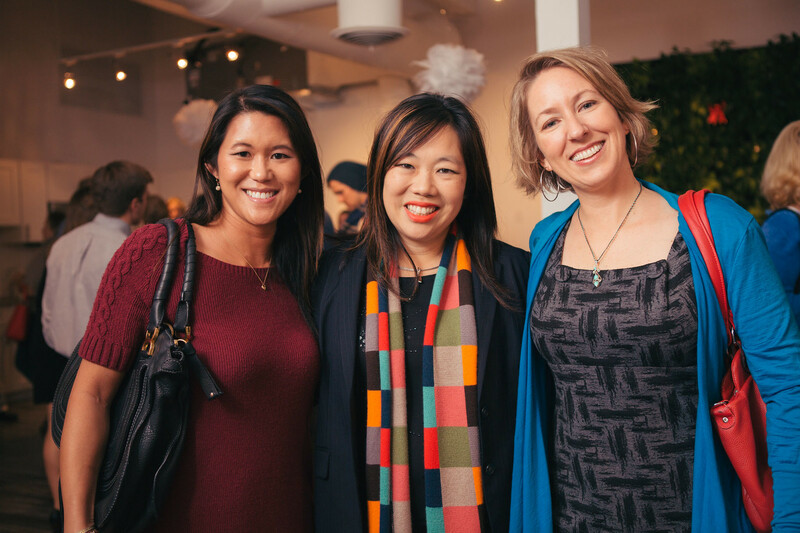 Left to right: Christina M. de Guia, SRQ President & Editor in Chief Lisl Liang, Julie Henry of The Pulse Team. Photo Credit: Senior Photographer Evan Sigmund. Holiday crooners, a delicious spread of hors d’oeurves and bubbly libations greeted the guests of our 2014 SRQ Media “Let it Snow” holiday party on Thursday, December 11. The warm fire at the door welcomed everyone entering the SRQ Studios for our annual celebration! Each year, the SRQ team relishes spending the evening with business owners and individuals who make “living local” in Sarasota and Bradenton a reality. SRQ Media Group hosted the “Let it Snow” Client Holiday Party on December 11, 2014 at the SRQ Studios. Photo Credit: Senior Photographer Evan Sigmund. The sound of laughter filled the party as guests enjoyed the photo booth and mingled. Michael’s on East catered the event with beautiful platters of the most delicious holiday fare! Guests enjoyed skewers of Malaysian beef satay, the most enticing shrimp provençal we’ve ever seen, warm Key West conch fritters served with Thai chili sauce, artfully assembled grilled endive bites stuffed with Cabrales cheese and pear (wrapped in Serrano ham! 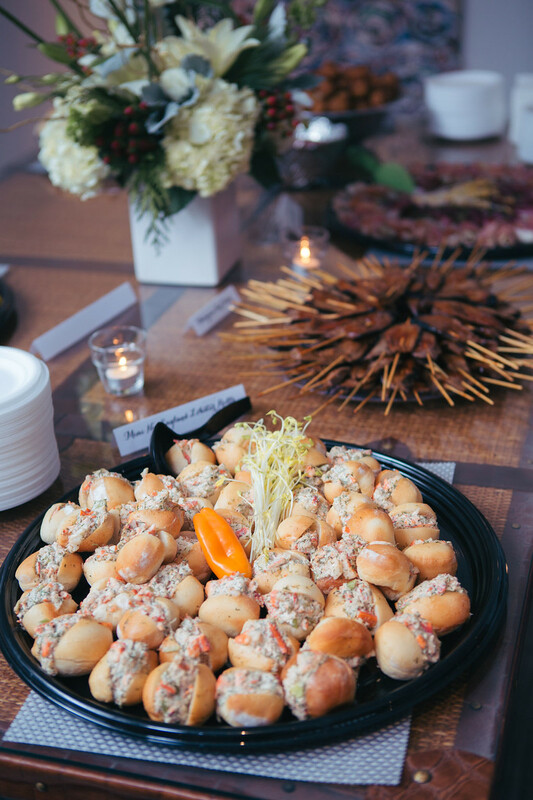 ), grilled beef rolls with scallions and soy sauce, delicate steamed vegetable shumai – and the crowd favorite, mini New England lobster rolls. Guests enjoyed delicious bites from Michael’s on East. Photo Credit: Senior Photographer Evan Sigmund. 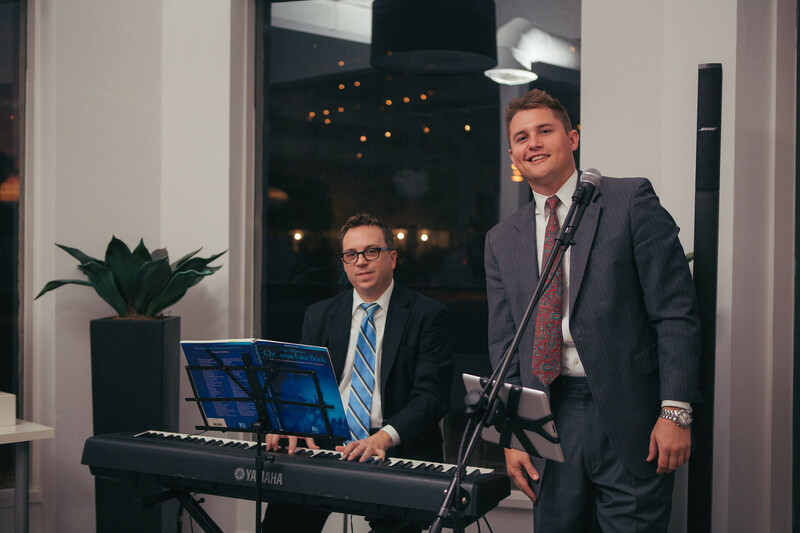 Stephen Fancher and Bart Lowther, financial advisors of MLC & Associates delighted the party with a selection of classic holiday tunes and a few crowd favorites (they had us at Michael Bublé, The Beatles, Frank Sinatra and John Legend). Don’t let their profession fool you – their music was magical. A selection of red and white wine and champagne, provided by Bijou Café was served alongside a variety of beers and the signature “Let it Snow” cocktail made with Siesta Key Rum. 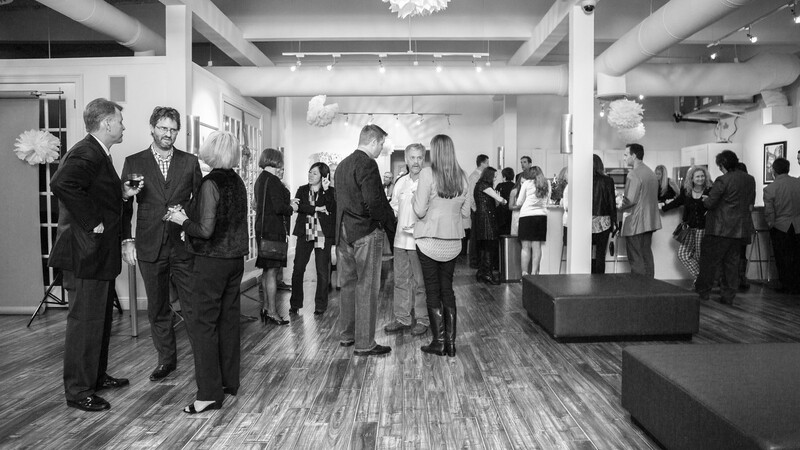 As the celebration carried on, our guests congregated in our favorite place at SRQ Studios—the kitchen. Stephen Fancher and Bart Lowther of MLC & Associates entertained guests. Photo Credit: Senior Photographer Evan Sigmund. Before the evening drew to a close, guests indulged in handmade gingerbread men from Sift Bakehouse and the most delicious mini treats from Heavenly Cupcakes. 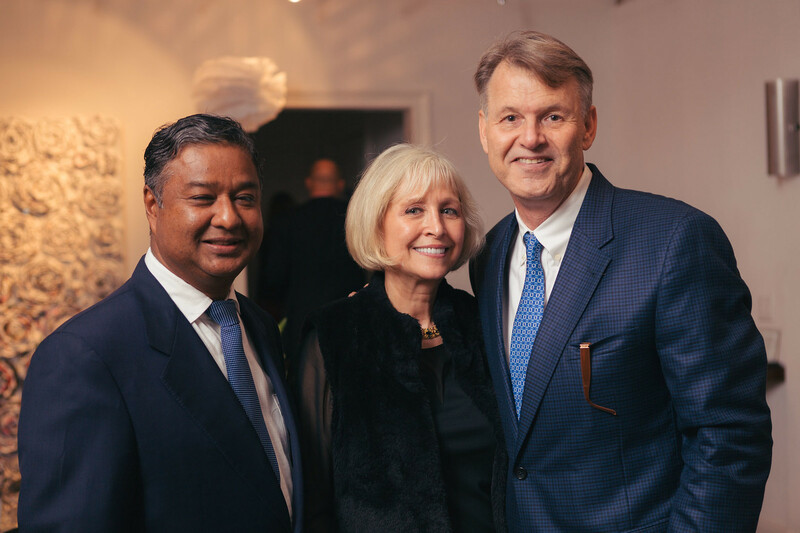 Daniel Jittu and Mikael and Karen Hansen of Copenhagen Imports pose for a photo at the SRQ “Let it Snow” Holiday Party. Photo Credit: Senior Photographer Evan Sigmund. On behalf of the SRQ Media Team, happy holidays to our all of our partners, clients and dear friends. Thank you for commitment to our community and the ways you make it so very special. If you are interested in hosting an event at the SRQ Media studio space for a holiday party, client function or board retreat, let us know! We would love to have you. Contact Mary Darby Guidroz at 941-365-7702 x221 (marydarby.guidroz@srqmediagroup.com) to place your reservation for 2015. ← SRQ ACCESS: HOT OFF THE PRESS!